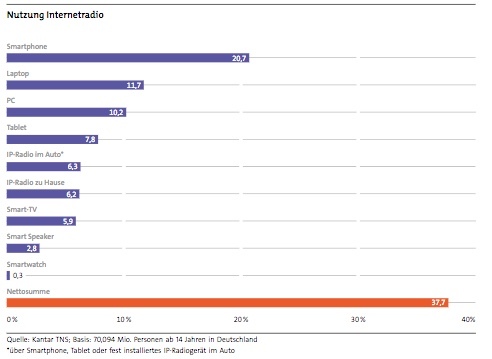 According to a report from die medienanstalten published this week FM continues to be the dominant listening platform in Germany. This year 92,2 percent of the households have at least one FM receiver compared with radio via cable/satellite 22,8%, DAB 17% and Internet 10,7%. There are approximately 135 million FM receivers in active use in Germany. Cable/satellite is losing its position to DAB and online radio. Internet has a rapid development with 37,7% of Germans listening online. Smartphone is the most important platform here with 20,7%. Listening in cars is 6,3% (smartphones, tablet or fixed installation as CarPlay). The smart speakers is the new online radio platform now used by 2,8% of the Germans.In the report there is also an interesting article about smart speakers. Digitalisierungsbericht Audio 2018 (Die Medienanstalten)Von Radio zu Audio: von alter Infrastruktur zu neuen Möglichkeiten?